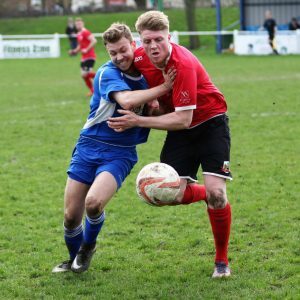 Knaresborough Town’s title celebrations are on hold for at least one more game as Conor Glavin’s late penalty rescued a valuable point for play-offs chasing Glasshoughton Welfare. A Knaresborough victory would have clinched the crown. Only a point is required now and that should be gained at FC Bolsover on Wednesday night. Bizarrely, Knaresborough had their former Manchester United and Farsley Celtic striker Colin Heath in goal and they fell behind to Andy Horbury’s deflected goal. Dan Thirkell equalised and it looked curtains for Welfare when Will Lenehan nodded home in the second half. That was until Glavin made himself the hero again. On an uneven surface Welfare seemed the brightest and Tom Carr headed a cross well wide whilst Ryan Ferguson lobbed the ball over stand-in town goalkeeper Colin Heath, but the ball drifted wide of the far post. Heath was nearly surprised by a long range free kick which he just managed to claw away around a post. The visitors only threats seemed to be high balls into the welfare area which were comfortably dealt with by Matt Zaniewski. Welfare were fortunate to take the lead on 28 minutes when a hopeful Glavin shot deflected off the foot of Horbury which completely deceived Heath and it rolled into the net. As the second half got underway Welfare’s James Kay did well to burst down the left and his pass to Horbury saw the tall striker’s effort blocked. At the other end, Lenehan flicked a header on from a long throw but Zaniewski got down to collect. The visitors took the lead on 58 minutes when after a number of corner kicks, Lenehan got onto the end of one from Dan Clayton at the near post and he nodded past Zaniewski. Shortly after this tempers became a little frayed and referee Will Cavanagh sent Welfare coach Richard Tracey off after a long conversation. Zaniewski also received a caution as he tried to hurry the official to restart the game. In the final 15 minutes Welfare went for broke and Horbury, in from the left saw his shot gathered low by Heath as Carr looked to pounce on any slip by the keeper. Welfare man of the match Lewis Akeister then stung the palms of Heath with a strong shot. Rob Marsh then found substitute Mitchell Wilshire at the far post with a great cross but Wilshire could only mis-kick wide. Welfare got a deserved equaliser with ten minutes later as Steve Bromley brought Horbury down in the penalty area and Glavin drilled the resulting penalty beyond Heath. Welfare had one final chance as the game drew to a close. Glavin saw his free kick blocked and the ball fell to Marsh whose first time shot was palmed inches wide of the post by Heath. 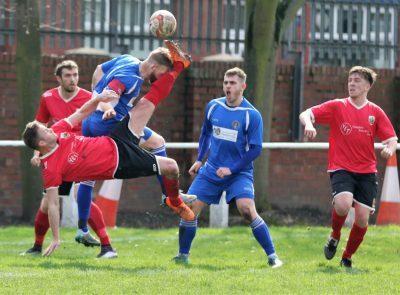 Glasshoughton Welfare: Zaniewski. Marsh, Kay, Akeister, Pashley, Hunter, Ferguson, Glavin, Horbury (Simpson), Carr, Oldham (Wilshire). Subs unused: Rollinson, Horn, Varley. Knaresborough Town: Heath, Thirkhill, Cook, Clayton, Donnelly, Lenehan, Youhill (Parkes), Wilson, Bromley, Walker, Clayton (Brown). Subs unused: Anderson, Hesketh.